A circa 1940’s Rolex bubble back automatic wristwatch, with an all original white dial with luminous arabic even numbers and stick markers. 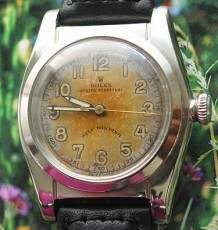 Original bubbleback dials are difficult to find in this condition. The only mark on the dial is a typical radium burn fron where the hands sat stationary for years and discolored the dial. 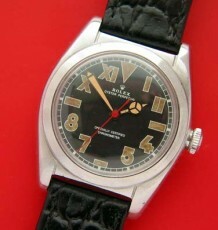 This watch is in superb condition and the Rolex automatic calibre NA630 movement winds easily and keeps excellent time. 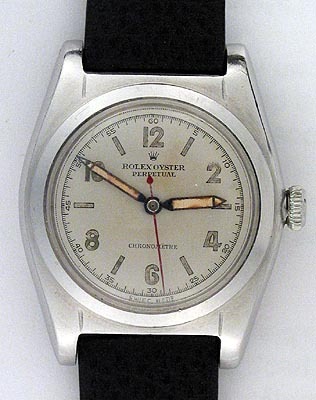 The crown is the original Rolex Oyster Patented flat top type crown, which still screws down tight onto the case tube. 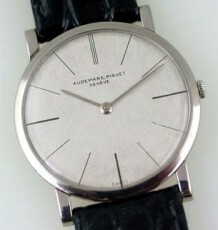 The stainless steel case is in its original unpolished condition and has no engraving on the case back.. 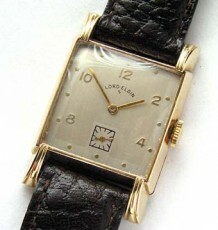 The serial number on the case dates this watch to the very end of 1944. The watch is supplied on a new Hirsch black Calf leather strap. The case measures 39.5mm long by 32mm wide, excluding the crown.